This is a much looked forward to event – the whole day is viewed with excited anticipation! Meeting old friends, catching up and viewing stitchery – dipping into purses for yet more fabric, and this is before the day’s proceedings get underway ! Well, what a great day we all had – our Mistress of Ceremonies got the show started ably assisted by her Committee members, whetting our appetites. 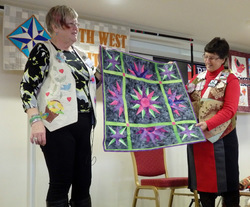 The morning session was presented by two of our own members from Plymouth, Pat King and Sandra Longley, who showed us their work, a mixtures of traditional and contemporary – a little to please everyone – and shared their quilting journey with us all. Having done a dual presentation with Ngaire several years ago, I knew exactly how they felt when faced with 200 eager faces waiting to hear what they had to say. 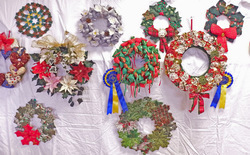 Well done Pat and Sandra as it is not easy being up there and your quilts were lovely. 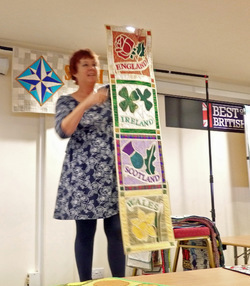 It would be good to see more of our own members’ work as we have a wealth of talent in South West Quilters – all you have to do is take a deep breath and think of England ! Then came lunch – and what a feast for the eyes ! A spread to be proud of and a Catering Manager with a big smile on her face ! Well done everyone for a superb faith lunch. The afternoon session held us spellbound as Gail Lawther took us through her latest book “Glimpses of Britain” and boy did we glimpse ! The imagination of this lady – just mind boggling where it all comes from. Didn’t you just drool at all those fantastic wall hangings and thanks to the big screens we were able to see the stitching at close quarters. She really is a master of her art and teaming it with a little British history made a most enjoyable presentation. Never a boring moment and I am sure we all came away with fingers itching to do something similar. 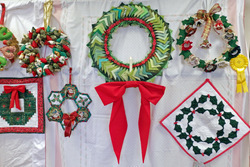 Three new members came with me and this was their first South West Quilters Day and they were enthralled with it all and had a wonderful day, as I think we all did. Thanks to Christine and her Committee for making it all possible.